This advert can be the summed as the best in terms of making fun of the impatient ones. The new Airtel broadband is 16 Mbps but with a slight hitch. At Rs. 2999/- with a Data Transfer Limit of just 20 GB. Just listening to a few hours of music videos on Youtube should be enough to exhaust the limit in no time. Thinking of downloading torrents is something one should not even think about. Not sure who Airtel is targeting with this plan. If you bought this plan do leave a comment. If you like Linux applications but don't want to install Linux, Portable Ubuntu is the perfect application for you. Once you start using it you might feel that all the Linux applications feel out of place with the Theme and fonts. That is where this quick tutorial comes into play. Download the XPLuna theme if you are on XP or one of the Aero themes for GTK 2. You can look at all the available options and keep the one that looks identical to your windows theme. The controls might look familiar but till you change the fonts it is almost like a waste. Copy the fonts from your windows installation. Open the terminal window in PUbuntu and then follow these steps. cd /mnt/C/WINDOWS/Fonts Here I am taking for granted that your Windows folder is in C:. Then make a new directory mkdir ~/.fonts. Copy Segoe fonts incase you are on Vista. cp Segoe*. * ~/.fonts. If you have Windows XP copy Tahoma fonts. cp Tahoma*. * ~/.fonts. Open System/Preference/Appearance. 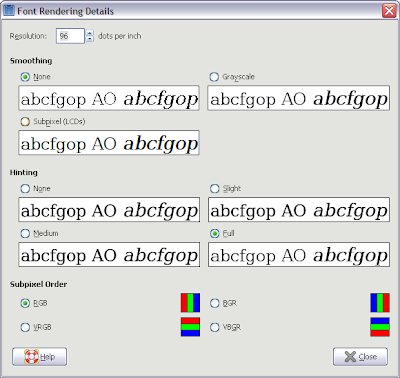 Select the font tab and select the fonts and the sizes as in the screenshot. This should give you the fonts as of Windows XP. For Vista select Segoe instead of Tahoma and set the size to 10 instead of 8. The fonts might look quite dark compared to windows. 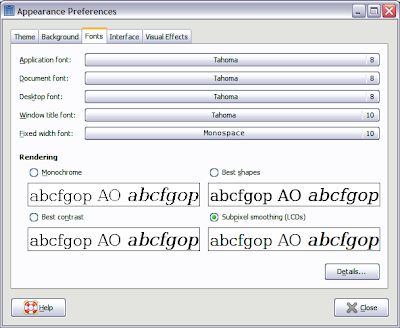 To reduce the anti-aliasing click the details button on the fonts dialog. And select the Smoothing to none. The fonts will look similar to windows fonts. Atleast for the dialogs but will not look good on other parts of the UI. I normally select Subpixel for Smoothing and Medium for Hinting. Though it still does not look like a real windows application but its close enough. I had bought an Acer AspireOne around 6 months back. I've used it for less than 3 months and the network drivers have been deleted like twice. And both the times the reason was a Live-Update. I went online and checked that the only way to bring back the thing to life was to reinstall everything. I want to believe that I know a thing or two about Linux, my first distro was Slackware in 1998. Its been a while and won't consider myself to be a linux noob. Given the fact that I know a thing of two about Linux and I was still frustrated. I could have spent 2-3 hours and somehow got the whole thing to life again, but I am just thinking about people who don't know thing about Linux. For them its just an OS that runs and they don't even have to bother about it. But when you laptop stops working what do you do? This is a laptop without a CDROM drive and the only way to reinstall is to use the recovery DVD. I am just thinking about all the people who got the update around two days ago and who know the last thing about Linux. If I could get frustrated with it, I am so sure they will think twice before buying a laptop with Linux. Some people could argue that its not a more known brand of Linux. But given the fact that this is what this laptop came with for most people its not really a choice. And given a fact that how easy its to install an OS, almost as easy as getting a root canal done. Linux on the desktop is a big FAIL for me. I use UBUNTU every now and then, I just installed portable UBUNTU but now all of a sudden all the files have gone missing. Its the second Linux FAIL for me. UPDATE: I finally got Portable Ubuntu running and I have to say its amazing to say the least. Probably this is the only way I would ever use Ubuntu. Its like getting the best of both worlds. Lately I've been busy with fefoo and hardly have anytime to blog. I've been on twitter lately and you can read the latest twits on the sidebar. I also started a new blog with all the [FW]'s and funny stuff that I seem to get in mail @ http://vivekjishtu.posterous.com/. Since I've completed the coding part on fefoo I will be working on the main site and try and integrate my digitial life in one place on http://vivekjishtu.com. Its been a long time coming and have been evading it since I've never had time to focus on it. It feels good that finally I have been able to finish work on fefoo and moving to comics.fefoo. It will be a place to read your favourite web comics. As of now it points to the page where I store a list of my favourite comics. But eventually it will point to http://comics.fefoo.com and allow you to add and remove comics. Lets see when that finally comes up.